The title of this post is deliberately silly. Children’s books are written (and edited and marketed and agented, etc.) by alleged grown-ups, and so — as Perry Nodelman points out — there is always a “hidden adult” in children’s literature. This is one of the central paradoxes of a literature defined primarily by its audience. “Children’s Literature” is written by adults, but for children — except that “for children” isn’t entirely accurate because the book has to navigate past many adults before it ever reaches the children, and thus is also written for those adults. To say that Children’s Literature is “for children” is both true and false. It’s literature written for a certain adult-defined concept of what “children” are, an idea that varies nationally, historically, culturally, etc. For that matter, as Nodelman’s The Hidden Adult (2008) notes, childhood itself is paradoxical — “static as well as dynamic, always the same yet a continuing process of becoming different that does not actually result in difference until childhood is finally over” (78). For a more thoughtful and through investigation, see Nodelman’s book, and the many other people who have expressed this idea more carefully than I. What occasions my re-statement of this idea is Maria Popova’s post “7 (More) Children’s Books by Famous ‘Adult’ Literature Authors” (Brain Pickings, 25 July 2011) which in turn led me to Ariel S. Winter’s delightful blog We Too Were Children, Mr. Barrie: Being a Compendium of Children’s Books by Twentieth-Century “Adult” Authors Currently Out of Print. One might argue that Popova’s list is trying to have it both ways: James Thurber, Langston Hughes, and Carl Sandburg are as accomplished writers for children as they are for adults. Those of us who study children’s literature know that Hughes wrote a dozen books for young readers, and we have read Thurber’s classic Many Moons and Sandburg’s Rootabaga Stories. But it’s hard to fault Popova here: most people don’t know these facts, and (as noted in the opening paragraph of this blog post), when it comes to children’s literature, the whole audience question is a slippery fish. 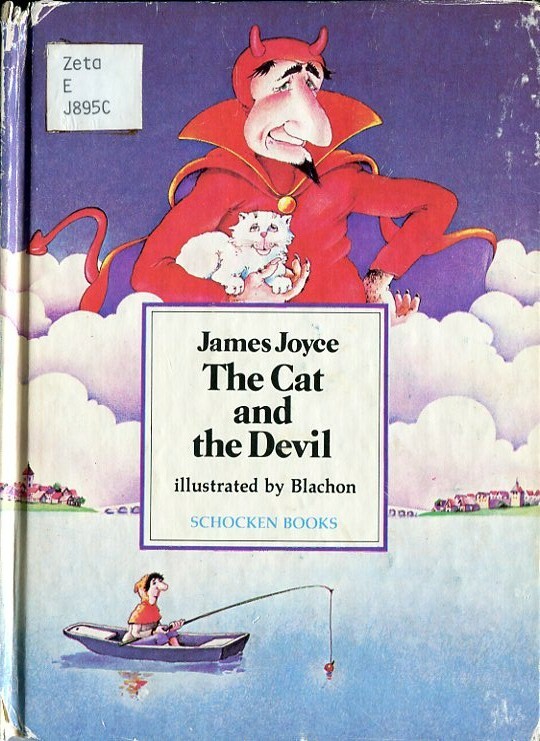 Image credit: Winter’s post on James Joyce’s The Cat and the Devil.